what do you think? read the questions before you scold. QUESTION: Well now, the reason we said before you scold was because we are not sure this is the correct place to ask our questions and if we are inappropriate here, just let us know .......ginny says you won't mind, and that you would like to look at this anyway ............never having met you, i don't know how she is so sure of that......but i gave up trying to explain women's intuition long a go. ..............well, there were also broken lances, other types of yari, broken swords, etc made INTO tantos as well when need be.........bearing in mind that even in WW2 japanese troops have attacked with sticks, stones, unloaded & bayonet mounted rifles, etc. hundreds of years later than the days of our beloved weapons. 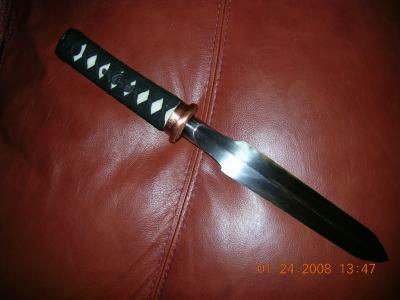 .................so, we made our own; it is 1065 carbon steel, with a tsuka from someone we both know & admire, it is double mekugied & though these apparently, were originally made without tsubas, a tsuba can be nice & has, as you know, a definite function, especially on a deep penetration weapon.......it is a real su-yari blade & highly maneuverable particularly with the sword adaption...............& unlike a more traditional tanto, is armor-piercing (car door, say no more) ...........because it is 17" long with a 10.25" blade it has the reach due to the fact that deep penetration is actually unnecessary in reality........it is used to stab & then rock back & forth horizontally for full effect.............................well, that's it; except, the questions........do you think anyone would be interested in this?........if we wanted to sell a few, how might we go about it? or maybe we shouldn't.....what do you think?.......please do not under-estimate the importance of your thoughts about this, really. It is definitely an innovative concept and may fulfil a niche within the Japanese sword market and collectors in general. First off, you will probably need to explain the history behind this design and it is quite obscure to many, but doing so will add to its appeal considerably. Demonstrations of its armour piercing capability will also go a long way towards increasing interest. As to actually selling them, I would recommend listing one or two on ebay at the starting price of $0.99 to get a feel for how much people are willing to pay and then working out it is feasible to sell them based on the cost of production. Good luck guys, and let me know how it goes.